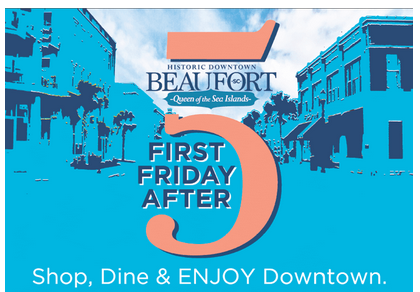 Beaufort’s First Friday 5th Anniversary gets 15 Minutes of Fame! 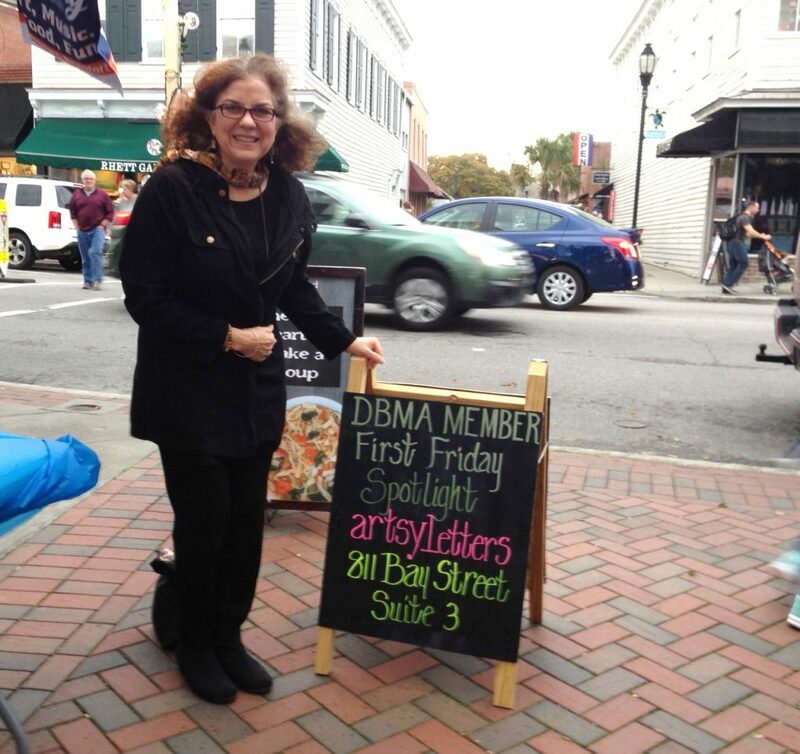 I was thrilled artsyletters was the Spotlight Business for First Friday this month. And icing on the cupcake was this TV coverage from Lyndsey Gough of WTOC in Savannah! Enjoy a taste of the celebration. (Ignore the windblown hair!) Link and pictures below. 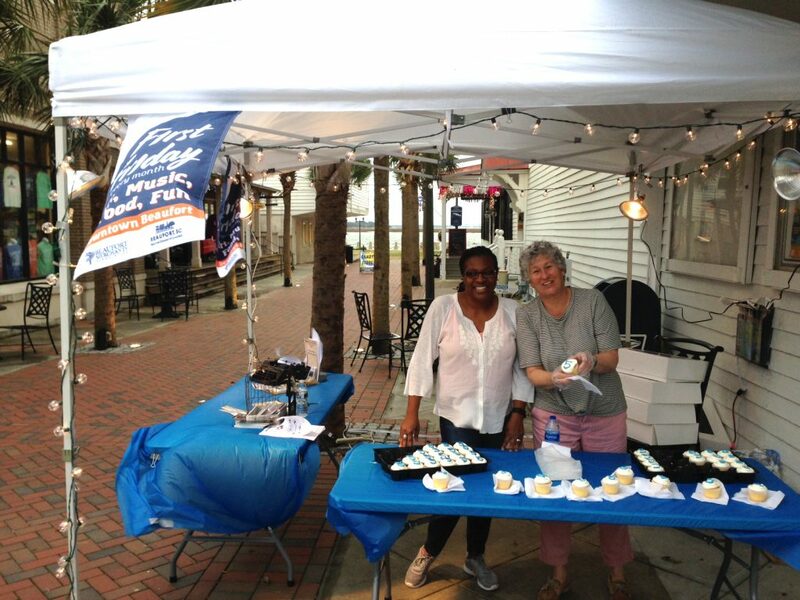 Rhonda and Bernadette from the City of Beaufort had no trouble finding takers for the yummy “5th Birthday” cupcakes! 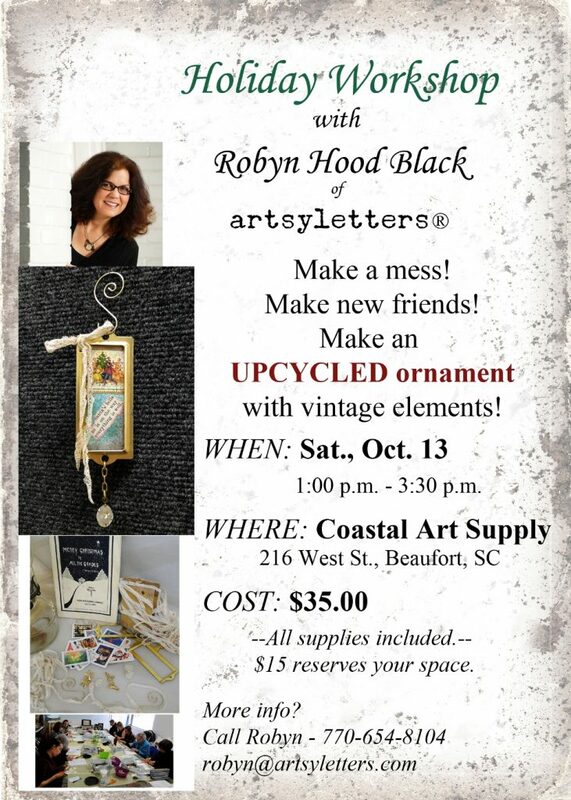 Upcycled Ornament Workshop – Join Us! It might still feel like summer, but technically, it’s fall – and the holidays will be here before we know it! Kick the season off with a fun afternoon playing with vintage finds and creating with new friends. Folks from my spring mixed media workshop at Coastal Art Supply (click here for their contact info) asked for more, so I’m offering an Upcycled Holiday Ornament Workshop on Saturday, Oct. 13, from 1 to 3:30 p.m.
All materials provided, including vintage postage stamps, antique ribbon, vintage text, vintage brass file cabinet label holders, vintage beads and charms, and vintage clock chain! 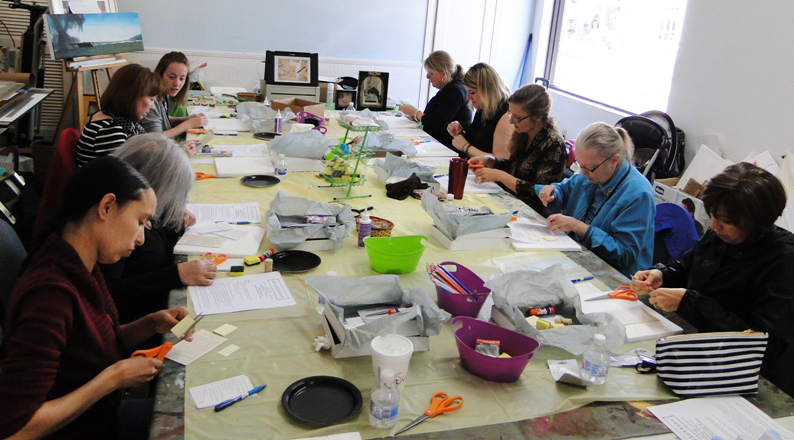 Participants will learn collage tips and how to work with jump rings. 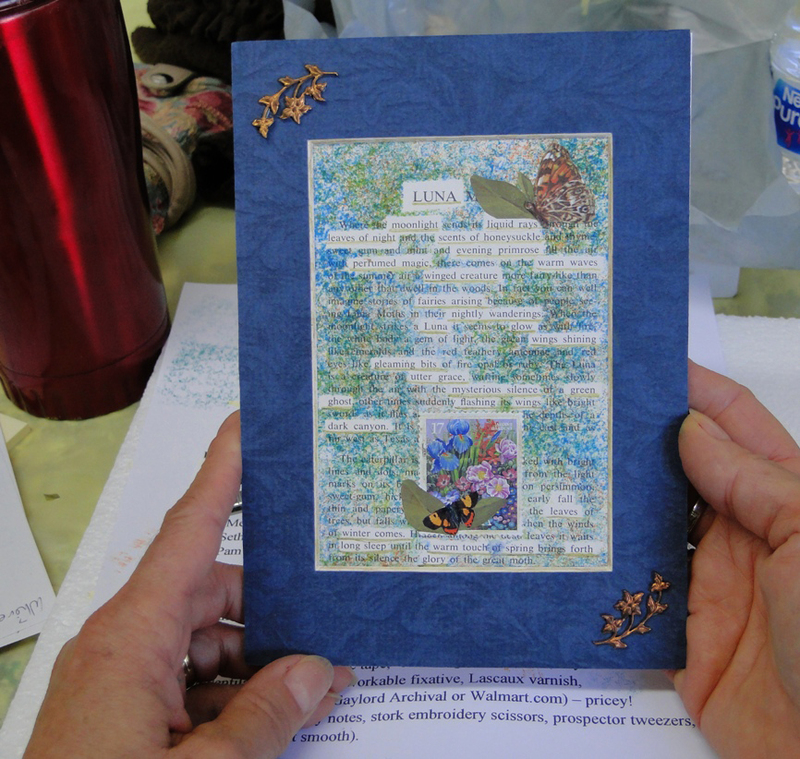 Found Poem-Mixed Media Workshop Highlights! 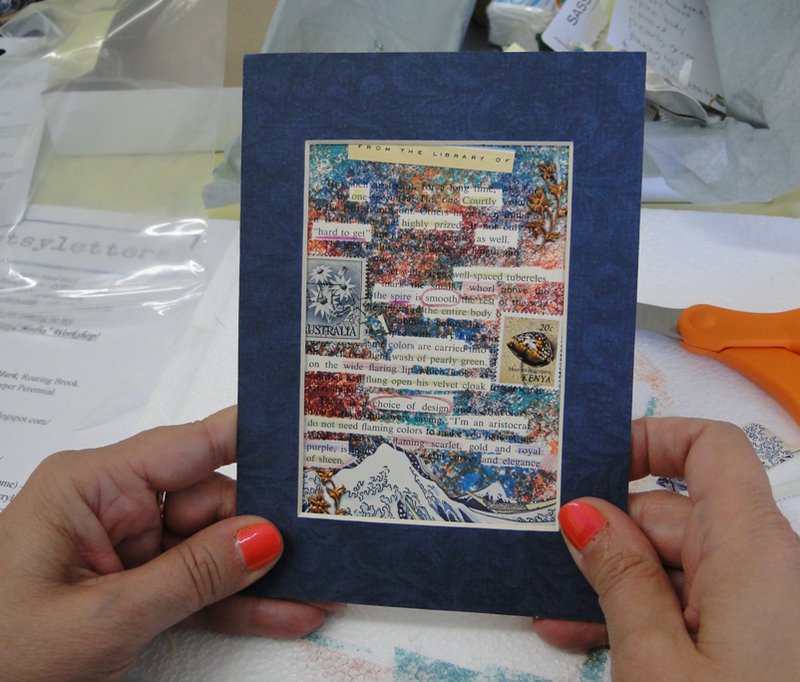 Our text for finding poems, also serving as our substrate (surface) were Edu-cards from the 1960s or so. I offered a choice of “shell” or “butterfly,” with complementary vintage bookplates, postage stamps, and bits of stamped brass bling. Of course, the actual subject of the poem and visual elements were up to each artist! That’s the fun part. The art (made in just two hours!) was tucked into a 5X7 mat, ready to pop into a frame. Yes! Butterflies as strong and successful! 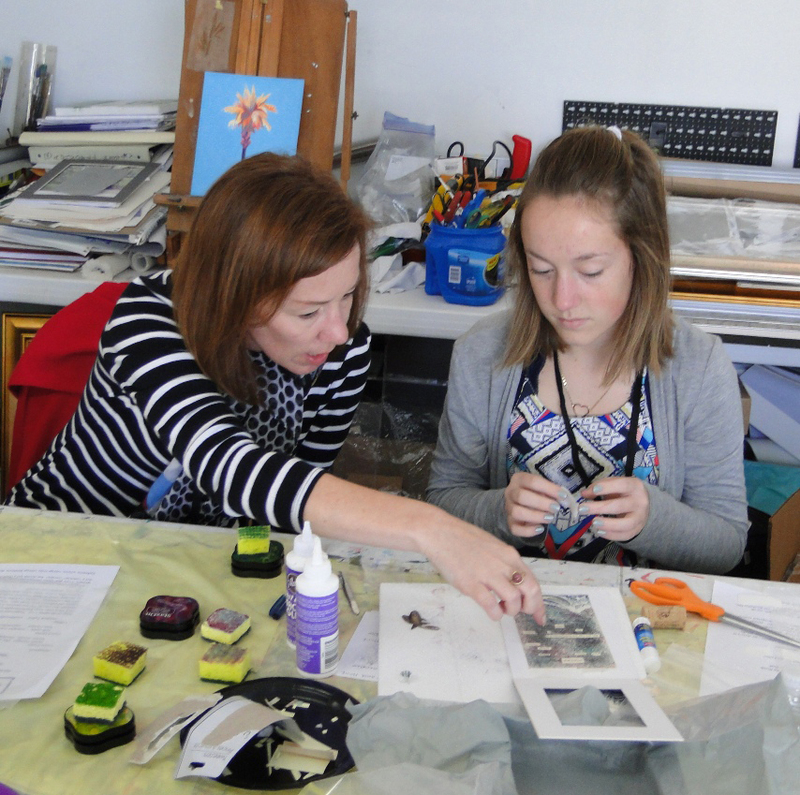 Jill and Sierra create mixed media magic! I just love that – and the cool tones and mysterious palette Sierra chose to illustrate it. Kim Poovey reads her found poem as her mom, Karen, adds finishing touches.. I am always surprised and delighted by what folks come up with, and it’s magical to me to see individual personalities shine through the choices of words, elements, colors, and the particular combinations of all of these. Want to learn fun tips and techniques to create a one-of-a-kind collage? 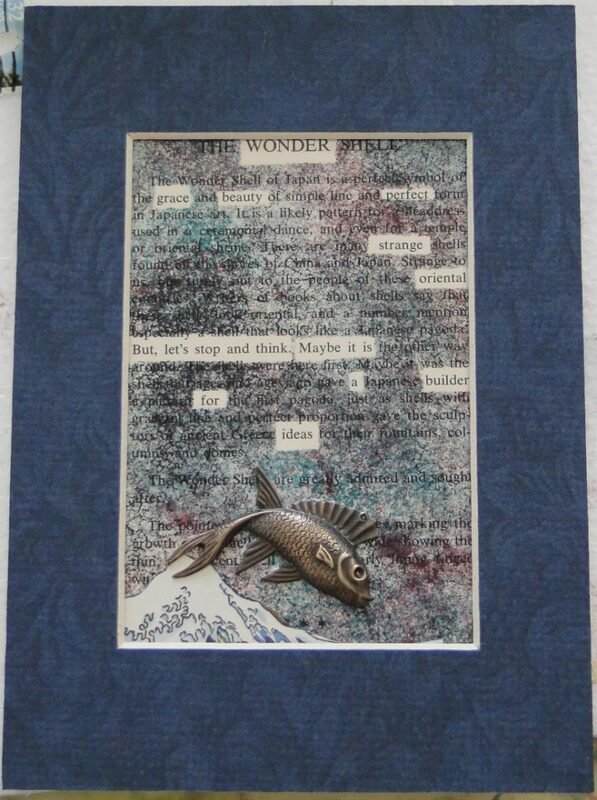 In this two-hour workshop, we’ll use vintage elements to make a found poem/mixed media piece matted to 5X7 and ready to frame. Take what you learn with you to make more fun art on your own! 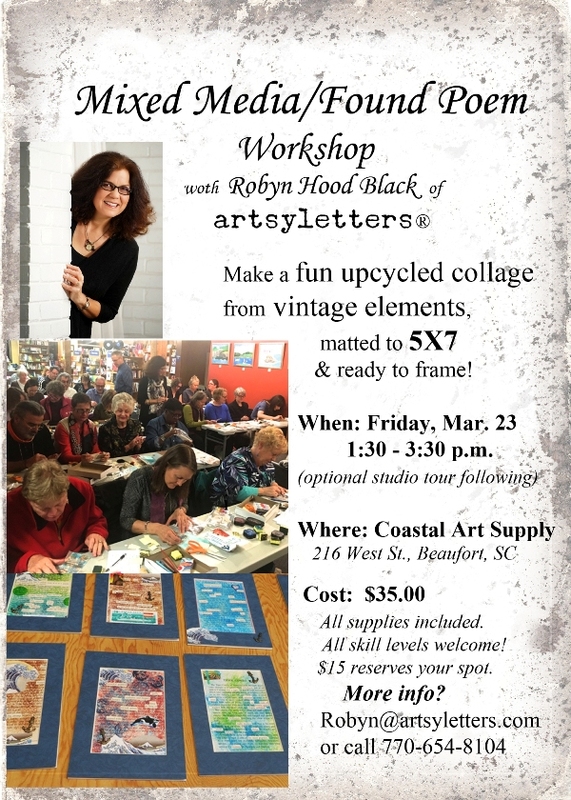 Several customers have asked for fun artsy-crafty class, and I’m delighted to offer this as my first class in Beaufort. No experience required – just an interest in words, art, imagination, and magical creations. I’ll supply scissors and adhesives & such in addition to all components. Time: 1:30 p.m. to 3:30 p.m.
What’s in store? It will be a more intimate version of the workshop I offered in Bellingham, Washington, just over a year ago. Click HERE for the blog post about it, including links to posts from participants! Greetings from the New Year side of the holidays! 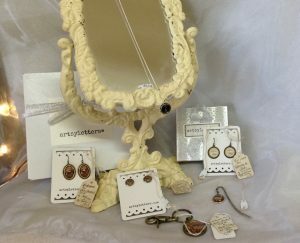 Thanks to all my wonderful customers who’ve filled a stocking or two with artsyletters wares in recent years. It’s an honor to be a part of gift-giving traditions. I look forward to creating all kinds of new items this year, and more of the offerings which need restocking. My studio is my happy place. :0) I’ll resume more “open” hours in February here in Beaufort on Bay Street (this month I’m hibernating with multiple creative writing projects and traveling some, too). In the meantime, my Etsy shop is open 24-7. 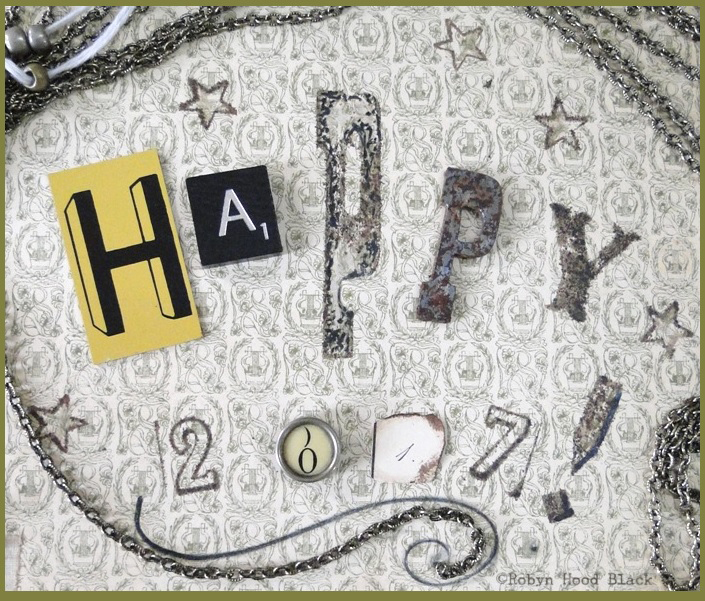 Wishing you and yours an inspiring and creative 2017! If you’re enjoying shopping in downtown Beaufort this week, stop in and say hello! I’ll be open Wed. through Friday afternoons from 1-4 pm, and possibly Christmas Eve too. 811 Bay Street #3. Look for my sandwich board sign on the sidewalk. If it’s out, come on up. (If you don’t see it, save yourself the climb – ;0) ). 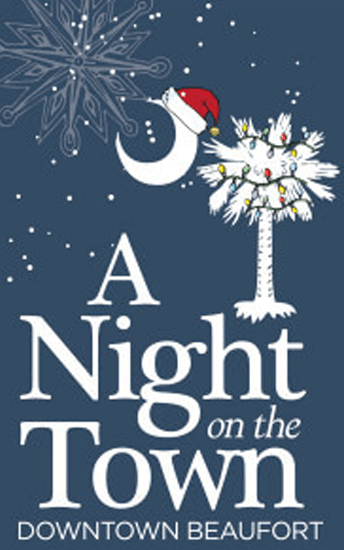 It’s NIGHT ON THE TOWN Time – Friday, Dec. 2! There’s a nip in the air, and the calendar says it’s time to do some holiday celebrating and shopping! Come by and say hello if you’re out and about in downtown Beaufort this weekend. (My A-Frame sign will be down on the sidewalk when my studio is open.) I’ll warm up some cider and have some goodies available Friday night, 6-9 p.m. 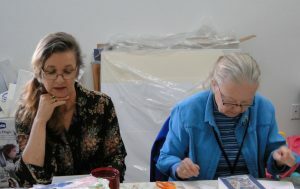 If you’re in Beaufort this busy holiday weekend, come on up to the Studio on Saturday afternoon between 2 pm and 4:30 pm! Browse handmade gifts for the bookish folks on your gift list and enjoy some refreshments. An elf has told me Santa will be at the Clock on Bay Street from 11 to 2, and you’ll want to enjoy the Light Up the Night Boat Parade at 5:30. (The Parris Island Marine Corps Band concludes the festivities at 7 p.m.) What to do in the afternoon? Visit downtown’s shops and galleries, and come say hello! We are at 811 Bay Street, above Modern Jewelers. The stairs are steep, but the welcome is warm. 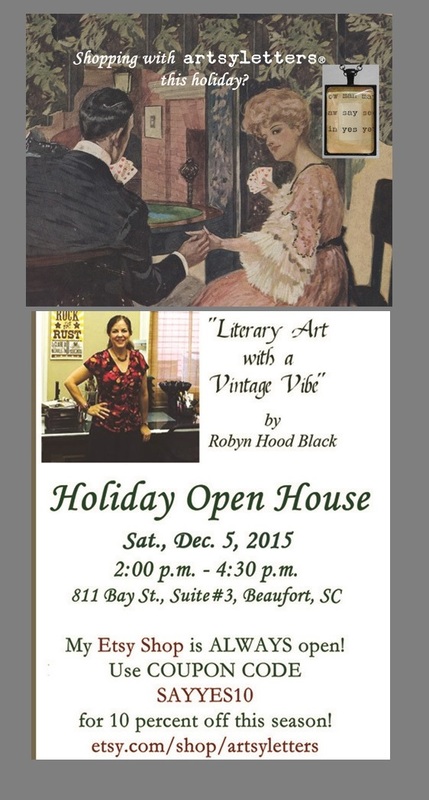 (Note – we won’t be open during Night on the Town this year, but do come by Saturday afternoon!) See you then! Looking for my author website? Click here! Sign Up for my Newsletter/Seasonal artsyletters Letter! artsyletters Letter for Spring 19! Spring Art Walk tonight! See you there… and, Happy Poetry Month! 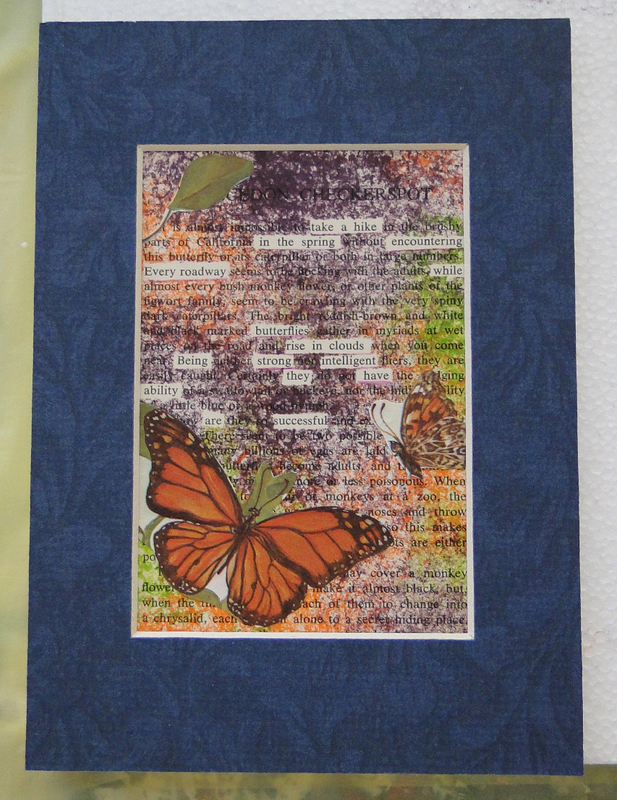 Ahoy, There – Upcycled Journals/Sketchbooks! HAPPY SPRING! Mark Your Calendars for ART WALK/First Friday, April 5! Robyn Hood Black on Psssttt…. 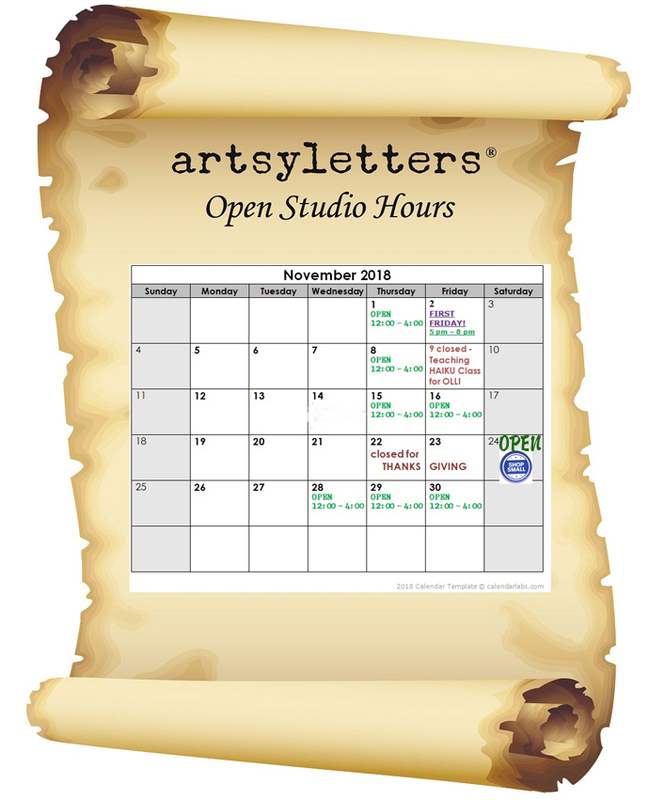 artsyletters is the “Spotlight Business” for First Friday, March 1! Linda Baie on Psssttt…. 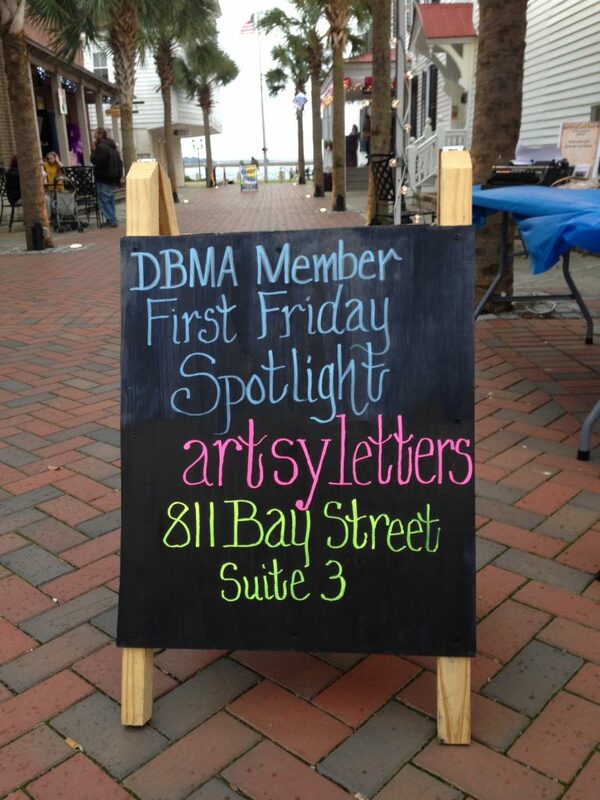 artsyletters is the “Spotlight Business” for First Friday, March 1! artsyletters on Upcycled Ornament Fun! 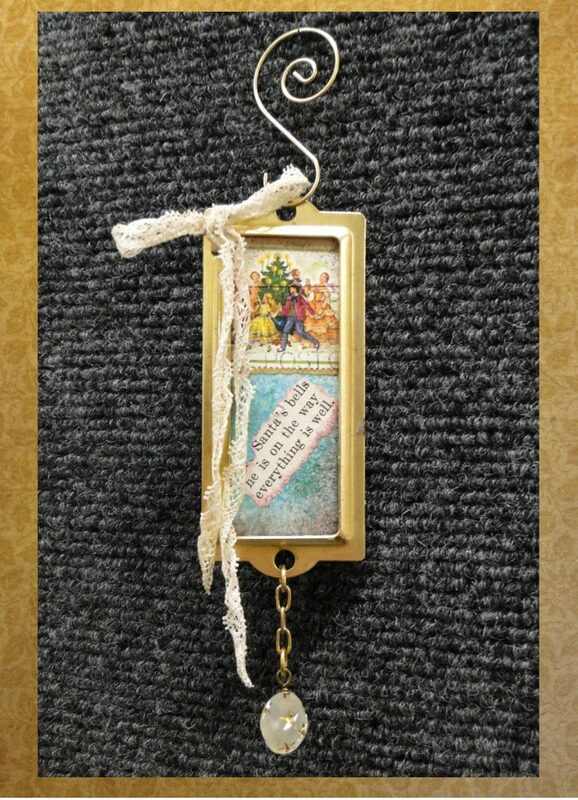 Amy Ludwig VanDerwater on Upcycled Ornament Fun! Robyn Hood Black on Animal Images from our Scotland/Ireland Trip! Unless otherwise noted, all content copyright © 2012-2015 Robyn Hood Black. All rights reserved. Please do not reproduce in any form without permission. Thanks.